One of the fundamental impediments to molding the Euro-Atlantic nations into a more unified and workable security community, as became apparent early in the deliberations of the Euro-Atlantic Security Initiative, is the lingering distrust that poisons too many of the region’s key relationships. For this reason we organized a working group to explore deeper solutions to the challenges of achieving historical reconciliation between countries divided by deep-seated historical grievances and of breaking through the long-standing impasse in resolving a number of protracted conflicts within the region. The two problems have as a common base the pernicious influence of that underlying mistrust of the other side. In this report, the Euro-Atlantic Security Initiative’s Working Group on Historical Reconciliation and Protracted Conflicts offers an approach that goes beyond traditional diplomacy to get at the root causes of the problem and urges a broader strategy for engaging society at large, the level at which solutions must be found. Twenty years after the end of the Cold War, the realization of hopes for a Euro-Atlantic world undivided, prosperous, and at peace remains elusive. There is as yet no sense of common goals between the enlarged Atlantic community of the West and many of the nations that emerged from the Soviet Union. No consensus exists on how the region should develop, what its economic future can be, or how both larger and smaller countries can take advantage of important global trends. Equally discouraging is the unabated continuation of a number of serious conflicts among nations and ethnic groups in the various parts of the region—from Georgia to Moldova, from Armenia and Azerbaijan to Cyprus. The legacy of deep-seated historical grievances contaminates too many relationships, including between Russia and a number of its neighbors, Turkey and Armenia, and Turkey and Greece. If allowed to fester, these differences will severely damage prospects for security cooperation across the entire Euro-Atlantic region, and hamper the social, political, and economic development of the area. These differences could also lead to expanded conflicts that could spill over into other parts of the region. Moreover, if left unaddressed, these conditions will threaten investments in the development of networks, information technology, and modern education, areas that already are not keeping pace with the rest of the world. Countries of the region, whether due to failures of governance or because they are caught in the middle of larger strategic maneuvering, are in danger of falling behind economically and technologically, which would leave them isolated. The price for inaction and permitting further drift is, in short, an unacceptable risk. 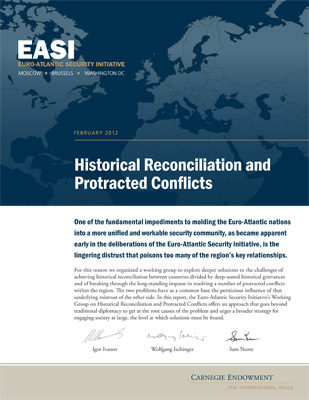 In the course of its work, the Working Group on Historical Reconciliation and Protracted Conflicts of the Euro-Atlantic Security Initiative (EASI) examined both the existing hindrances to cooperation and the methods used during the past two decades to resolve crises and build a security community in the Euro-Atlantic region. We have concluded that these strategies have not worked. Past efforts have proceeded from the assumption that political and diplomatic methods could be grafted onto existing systems and attitudes without first developing new social and economic foundations for change. As a result, the “diplomacy” of the region has been limited primarily to exchanges of well-worn positions and the cementing of existing attitudes. Overcoming this dangerous situation will require an entirely new strategy both within the region and with regard to its relations with the rest of the Euro-Atlantic world. The working group proceeded from an understanding that a pursuit of security cooperation and a sense of shared responsibility within the Euro-Atlantic region—prerequisites for a regionwide security community—are essential components of building peace, freedom, and prosperity in this corner of the world. It is fundamental to enabling the Euro-Atlantic community to work cooperatively to solve the many new challenges it faces. Yet, this task is very much a work in progress. Efforts at advancing toward a more productive, effective security community remain burdened by a mixture of diverging national interests, divisive historical memories, deep pockets of mistrust, ongoing conflicts, and a lack of vision. Achieving these goals has been complicated by an unprecedented pace of change—technologically, economically, politically, and socially—that has reshaped the global context within which the transformation of the Euro-Atlantic space is occurring. These forces have transformed the relationships not only between and among the region’s states, but between those who govern and those who are governed. They have also affected the way we understand the role of traditional political structures. These myriad changes have rendered inadequate past methods of handling many difficult challenges and promising opportunities. At the same time, the changes have unleashed new energies and capacities of citizens outside government. These resources of civil society can, in our view, be the foundation for a new and dynamic approach to the region. As is often the case in postimperial conditions, one of the first indications of these many changes was the emergence of conflicts throughout the region. The unresolved conflicts in Europe’s East are certainly not the only clashes in the Euro-Atlantic region. However, they require special attention because they generate tensions that stifle development, are fraught with the danger of open warfare, and risk involving major international actors in dangerous and disruptive confrontation. The ongoing Georgia conflicts are only the most recent example. Furthermore, failure to address these issues actively forgoes important opportunities to demonstrate how the capacities of a working security community can bring benefits to the parties to the conflicts as well as to the community as a whole. There are, of course, complex reasons for the area’s seemingly intractable issues. In this part of the world, much like in many parts of former Yugoslavia, under negotiation are competing “visions” of Eurasia. On another plane, these situations are complicated by the pervasive mistrust between Russia and the United States and its allies, and the unresolved historical baggage shared by Russia and a number of its neighbors in Europe. These disputes, deficits of confidence, and diverging priorities have burdened national and international development, been destructive to the lives of the residents of the area, and threatened at times to damage broader regional interests. Taken together, the competing visions and lingering mistrust are major root causes for the continuing background insecurity in Europe. What’s more, they are a serious obstacle to creating a security community in the larger Euro-Atlantic region. The presumption among all major players, including those in the West, that existing patterns of behavior can be melded easily into a common identity. Failure to understand the power of the region’s deep-seated attitudes and rivalries has led to an overreliance on the tools and institutions of traditional diplomacy. Although the work of both government and nongovernmental institutions has been dedicated and often farsighted, the overall approach in both East and West has been to ignore the need for the involvement of civil society. Efforts to understand the fears and anger of peoples emerging from an imperial past were too limited and too short-term in nature. Rather than proceeding from the need to rebuild structures of society, major participants assumed that skillful management and good work would overcome the burdens of history. This has not been the case. In a number of instances, “diplomacy” has often made problems more intractable. The failure to address adequately regional disputes (currently, principally in the area of the former Soviet Union) where confrontation continues to present a danger of open conflict or threatens to undermine efforts to build Euro-Atlantic cooperation and consensus. The absence in the East of sufficient historical reconciliation to heal the wounds of the past and overcome the burdens of historical enmities and mistrust. After two decades of persistent, although often incoherent, efforts we have to conclude that achieving the visions of the early 1990s requires a new initiative. We need now to address the underlying causes of the dangers across the region and to achieve productive movement on the unresolved conflicts in Europe’s East. The countries of the Euro-Atlantic region cannot afford to squander the opportunity created by positive developments in recent years. Societies have not been standing still. The way forward can be pursued by practical action and the powers of creative thinking. We recommend, in short, active and positive action by the key parties in the Euro-Atlantic region to mobilize behind an initiative that will bring about tangible movement toward a Euro-Atlantic Security Community. Since the end of the Cold War and dissolution of the Soviet Union in 1991, Euro-Atlantic security cooperation has advanced along on a well-worn track of treaties, organizations, and consultations designed to solve old problems and establish new links. The most innovative of these efforts was devised within the Conference for Security and Cooperation in Europe, renamed in 1994 the Organization for Security and Cooperation in Europe (OSCE). The resulting institutional framework has achieved notable successes. It made possible, for example, the practical and continuous cooperation among NATO, the EU, and Russia that brought about the Dayton Accords to end the Balkan wars. And these developments have also stimulated notable efforts at reconciliation both among countries of the former Soviet Union and between those countries and the West. In general, it is safe to say that security and prosperity within Central Europe have improved enormously, and important steps forward have also been made in the former Soviet Union. But, it remains the case that a sense of alienation exists on several planes. The task of community building is still far from complete, and in several cases has lost momentum. Unfortunately, the key nations and organizations within the Euro-Atlantic community, including NATO, the EU, the OSCE, as well as the Commonwealth of Independent States and the Collective Security Treaty Organization, have followed generally uncoordinated paths, often competing with each other, but rarely pursuing mutually supportive strategies. As a result, their contribution has been significantly less than would seem possible with the resources they have to offer. This shortfall has been particularly acute in the eastern portions of the Euro-Atlantic world and in attempts to address old divisions between East and West. Diplomatic efforts so far have adhered too strictly to established channels and methods. Nongovernmental and international organizations, along with other elements of civil society, have sought to build more local linkages and dialogue, but these efforts have been hindered by competition among players (for example, the EU and the OSCE), and have had little effect on formal negotiations. Furthermore, the deep interrelation between political and cultural issues has been insufficiently taken into account, and some observers believe that the role of Russia is often a difficult hurdle to clear. After two decades of frozen status quo or even backward movement, one thing appears to be clear. Efforts by the parties to the region’s ongoing conflicts—as well as by the United States, Europe, and Russia—to build fruitful cooperation through the tools of traditional diplomacy, as well as through reliance on security policy and its instruments alone, have failed. Our most important recommendation is that if efforts to build cooperative security are to succeed, the manner and goals of relationships across the Euro-Atlantic community must change significantly. Competition among organizations and between governmental and civil society organizations must cease. In particular, the vastly changed social, economic, and political landscape brought about by the emergence of new and rapidly expanding forms of civic participation must take a central place in defining our efforts. Determining a means to restore momentum toward historical reconciliation among nations and societies where that process has stalled. Our recommendations focus on these two core concerns. At the heart of our proposals is an initiative to be taken by the region’s major players—the European Union, Russia, and the United States—to establish a stewardship of cooperation in dealing with twenty-first-century challenges. This is similar to the structure that was used to address the smaller but equally virulent Balkan crisis in the 1990s. It included cooperation with NATO, the OSCE, and the United Nations. It was multi-disciplinary in nature and ultimately succeeded in bringing an end to the wars in this region. We believe that the same principles can be applied to this much larger and longer-term task: harnessing the critical energies and capacities of citizens outside government to build a new consciousness of cooperation within the region and across the Euro-Atlantic world. This initiative would involve building a foundation of common understanding across the Euro-Atlantic region, as well as in areas of local conflict. It would develop a full partnership between government and the institutions of civil society and encourage governments to employ and enlist the full extent of their tools rather than rely on military and security policy instruments alone. The recent discussion of a “Marshall Plan for civil society” at the meeting of the German-Russian St. Petersburg Dialogue is a good example. Our initiative envisions a commitment similar to that made twenty years ago in Bosnia. It is for the active development of new tools and processes to promote both reconciliation across the region as a whole and between particular states and peoples where long-lasting hostility and mistrust prevent forward movement toward cooperation. Simultaneously, we urgently advise that more efforts be expended to address possible new approaches toward the existing protracted conflicts. These approaches are detailed in a subsequent section of this paper. Finally, this initiative would not be tied to a form of government, religious or cultural orientation, or membership in a specific organization. It would utilize the talents of all elements of civil society—such as nongovernmental organizations (NGOs), businesses, and religious and social organizations—and exploit to their fullest extent existing initiatives such as the EU’s Eastern Partnership to lay the groundwork for steady evolution based on the principles of the Helsinki Final Act. To initiate and revive momentum toward reconciliation, we propose that the EU, Russia, and the United States declare formally at the council of the OSCE that they accept the responsibility to develop a joint Stewardship Plan for the Twenty-First Century designed to produce functioning Euro-Atlantic security cooperation. With the prestige of leadership will come the attendant responsibility to build a greater sense of common security both across the whole Euro-Atlantic community and within its parts that remain unsettled and conflict-prone—in particular, the new Eastern Europe (Ukraine, Belarus, and Moldova) and the Caucasus. In so doing, the United States and the EU would recognize Russia’s political and security role as a full Euro-Atlantic partner in addressing the issues of this space. Russia, for its part, would accept responsibility for a constructive neighborhood policy that contributes to the growth of sovereignty, of mutual respect among nations, and of civil society in the region. On this basis, the three would dedicate themselves to pursuing coordinated initiatives to deal with existing conflicts. They would commit to engaging with all levels of civil society to enlist new and as yet largely unused forces as support for building strong security cooperation across the region. The initiative would make full use of the strengths and capacities of the OSCE, which is the only organization whose membership includes all countries of the region. The principles of the Helsinki Final Act and follow-on agreements also provide a broad, accepted foundation for political efforts at building civil society. This effort would depart from past initiatives in that it would not foresee formal treaties or new organizations. Instead it would be multidisciplinary and multidimensional. The goal would be to provide the impetus for widespread efforts. The role of the OSCE would be to coordinate and give substance as necessary. An important step would be to restructure the OSCE council from a purely deliberative body to an organization with implementing responsibilities. The staff of the secretariat would be expanded and restructured. The council would appoint working groups in which implementation would be assigned to specific officials rather than be controlled by consensus. To increase flexibility, the EU would abandon its demand to speak with one voice in these working groups. In other words, this would be a political initiative based on the full authority of the EU, Russia, and the United States, which has promised to use all methods available to get cooperative security processes back on track. The central idea of the security community that EASI seeks to establish is that parties in the Euro-Atlantic region agree never to use or threaten force against one another. Recent deviations from this principle have resulted in flaring tensions around protracted conflicts between and within states. Building a security community, therefore, requires settlement of these protracted conflicts coupled with reconciliation between the parties. The post-Soviet conflict zones, in particular, are zones of undetermined sovereignty, formed out of the legacy of the failure of the Soviet system to manage disputes between autonomous areas and Union Republic capitals. Work needs to be done, drawing on examples in wider Europe, to study creative models that can fashion future sovereignty constructions acceptable to both sides. Protracted conflicts in the post-Soviet space—South Ossetia, Abkhazia, Nagorno-Karabakh, and Transnistria—are not the only ones that pose dangers for peace and stability in the Euro-Atlantic region. However, each of these conflicts reflects above all the basic failure of the Euro-Atlantic countries to address adequately ongoing centrifugal forces and the security needs of states and substate groups in the aftermath of the Soviet Union’s collapse. For this reason, EASI’s effort to construct a comprehensive, inclusive security community offers an appropriate background on which to apply renewed energy toward conflict resolution. By the same token, achieving progress in any one of these conflicts would help Euro-Atlantic states to sustain a new unifying narrative stressing their common destiny in a globalized world. At present, the conflict over Nagorno-Karabakh is highly volatile, with a real prospect of renewed fighting between Azerbaijan and Armenia. Both parties are focused on building military advantage. Should renewed clashes occur, it is not difficult to imagine that Russia, Turkey, Iran, and other states may be easily drawn into a wider regional conflict. In the face of such grave risks, the international community has demonstrated a remarkable degree of unity—engaging all sides at the highest levels, formulating principles for resolution of the conflict, and pushing the parties to accept compromise. The problem has been the lack of serious interest from the conflicting parties in implementing the widely recognized terms of a realistic future settlement. The conflicts in Abkhazia and South Ossetia are not simply battlegrounds of wider Russo-Georgian tension, but the two are intimately connected. The immediate requirement is to prevent violence along the borders separating the parties. The Russian Federation and Georgia, but also the United States and the European Union, hold primary responsibility for that function. Beyond this limited objective, it may be worthwhile to focus on a two-track approach: Tbilisi-Sukhumi/Tskhinvali and Georgia-Russia. One area of discussion and potential cooperation could be security ahead of the 2014 Winter Olympic Games in Sochi. In all instances, practical cooperation aimed at making life more secure and more bearable for the people most directly affected by the conflicts should be the top priority. Transnistria appears less prone to a renewed outbreak of fighting, though it is not entirely without risk. While the external parties to the formal 5+2 conflict resolution process agree on nearly all the basic building blocks of a resolution, the positions of Moldovans and Transnistrians themselves have drifted farther apart during the course of two decades of relative stability and de facto separation. This sense of stagnation and drift has emboldened individuals to make irresponsible, provocative statements that poison the atmosphere for conflict resolution. What is now urgently needed is sustained attention from the mediators and observers to the 5+2 process, plus much better application of the already existing tools to promote reconciliation and trust between the sides. Demonstrating in Transnistria that conflict resolution is indeed possible could well be a stepping stone for the Euro-Atlantic Security Community. Finally, further treatment of the conflicts in isolation from one another is unlikely to yield the desired results. Even more damaging is the fact that the application of methods to engage civil society—to develop commercial, religious, and civic organization connections across lines of conflict, for example—is being hindered by the confrontations that arise from the conflicts. The Euro-Atlantic world is thus losing on two counts: the conflicts continue and the important job of building a sense of community in the region is being postponed. Therefore, traditional diplomacy must by all means continue and will remain essential. However, we believe that sufficient commonality cannot be built either within the region or between the various parts of the Euro-Atlantic community without a concerted effort that includes the diverse elements of civil society. Only through such extended participation will it be possible to develop the shared visions that must underpin a productive and effective Euro-Atlantic Security Community. There is a clear need to go beyond governments (where formal conflict resolution processes effectively stop) and to find means of building support for peace among elites and the wider publics of conflicting parties. A point of departure would be to urge leaders on both sides to make rejection of war by the population as a whole a top priority. Moreover, expansion of traditional diplomacy to include Dartmouth-style Track II dialogue, “next generation” meetings, and use of social media to prepare the peoples involved for accommodation and development of a non-zero-sum narrative should be employed to alter the present dynamic. Former heads of state and government, such as the assembly of elders created by Nelson Mandela, could be a powerful resource to address critical impasses. The Euro-Atlantic Security Community must endorse and defend the basic principle of respect for the rights of national minorities and of individuals, as enshrined in the Helsinki Declaration. Peoples must enjoy the right to self-determination on individual and group levels without requiring the right to secede from nation-states. Social relationships need to be built on values and interests genuinely shared; individuals should proceed to reach agreement on the basic principles of behavior when dealing with differences. Fostering robust civil society is key to enhancing intersocietal links. By injecting more openness and promoting the culture of dialogue and give-and-take within societies, one can reduce mutual opposition and build confidence between societies, which enables moves toward conflict resolution. Democratic institutions are more likely to enable successful conflict resolution, but the process of democratization can be unsettling. In dealing with each conflict, Euro-Atlantic states should cooperate to encourage a transition from Soviet-style autocracy to more pluralistic systems of government. This will enable more pragmatic voices from the business community and the population at large to hold their leaderships accountable for productive participation in formal conflict resolution processes. A case needs to be made in favor of material contributions for conflict resolution. Problem solving in all four cases enumerated above will require funding, although not nearly as much as in some other areas of the world. Some of those who stand to benefit from resolved conflicts should be urged to chip in, while those who will lose may need to be compensated. Given its geographical position and its historical role, Russia needs to play an active and positive part in these efforts, in cooperation with others, including the EU and the United States. It is important to institutionalize conflict settlement. The OSCE might be a useful framework for action and an instrument of choice for some of the activities in the realm of conflict resolution. (For example, the OSCE could serve as a link between Track II dialogues and official contacts.) It cannot, however, be the exclusive instrument of the Euro-Atlantic Security Community. The Euro-Atlantic Security Community is not embodied in a single organization, but must find expression in the work of all the region’s institutions. In the case of the OSCE, realistically speaking, there is only so much that can be done to teach a thirty-five-year-old structure to perform new tricks. The goal is to help the organization adapt its potential to achieve the objectives we set ourselves at the outset. Finally, the Euro-Atlantic region’s leaders need to call to account those in the community who continue to abuse its greater security interests through negative policies, statements, and practices that deepen rather than ameliorate conflicts and divisions. Dealing with historical grievances is not a new issue in European security building. Old enmities and deep-seated suspicions plagued the continent until the end of World War II, when Western Europe began to address them as part of the Atlantic and European projects. Those efforts resolved not only Germany-related issues but those affecting many others as well, including relations between France and Germany, Portugal and Spain, and Italy and Austria. In general in Europe’s East, however, historical issues were not resolved after the end of the Second World War so much as frozen. The reconciliation effort was taken up in Central Europe only after the end of the Cold War, when several former communist countries moved toward reconciliation as they went through a process of domestic democratization and European and Atlantic integration. In particular, the method of “slow diplomacy” within the European Union contributed greatly to intra-European reconciliation and to positive movement elsewhere as well, including Ukraine-Poland and Ukraine-Hungary, and some areas of the Balkans. It has to be stressed, however, that both post­–World War II and post–Cold War reconciliation “success stories” occurred in the general context of, or were driven by, the dynamic of Atlantic and European integration. This context continues to be present in a number of current situations, including in the Balkans, as well as between Greece and Turkey, but it is lacking in the case of Russia and many of its immediate neighbors. Even so, Russia’s own relations with a number of former World War II adversaries have improved—for instance with Germany—to the point where a sense of security community already exists, and in some cases, to the point of full reconciliation—as with Finland. There has been positive movement in relations between Russia and Poland as well as its Baltic neighbors, although that progress remains tentative and fragile. The main issue now is to build on these successes in Western and Central Europe, and in relations between Russia and key neighbors, to achieve consensus on a Euro-Atlantic Security Community and commitment to the project by the multiple partners involved. In making this effort, national leaders should learn from the process of reconciliation which took place within the European Union. “Slow diplomacy” did much to help states overcome historic enmities by focusing on practical cooperation and consensus on major issues. The process began on the basis of accepted democratic rights, such as those inscribed in the Helsinki Final Act, but it did not require specific prior commitments. The same would be true in our proposed initiative. The plan would be presented to the OSCE for endorsement and support. The EU in particular would abandon its efforts to limit OSCE responsibility in conflict regions. The United States would agree to increase NGO resources and to focus its efforts on cooperation with Russia in the region. The OSCE would establish a task force of countries involved in each conflict area to develop courses of action and to coordinate their implementation. Courses of action should be developed in dialogue, engaging all parties to the conflict as well as outsiders who will play a role in its resolution. Each member of the OSCE would agree to implement the proposal. Countries of the region would begin separate consultations among themselves, with support of the OSCE, to define their own special programs, especially in the field of cultural and historical reconciliation. Seeking justice for the sake of justice is not enough. A necessary prerequisite for historical reconciliation is the perceived need to work for it in the national interest. The new dialogue between Moscow and Warsaw had everything to do with the necessity of removing obstacles in Russia’s relationship with the European Union as a whole. Respect for the formerly aggrieved party is critical. In order to be able to deal effectively with Warsaw, Moscow had to show genuine respect for its erstwhile satellite, for example. The Poles would expect no less than equal treatment. Eventually, the Russians recognized them as an equal party for dialogue. Reconciliation is primarily a bilateral interstate process driven by the specific needs of the parties and the opportunities open to them. The role of global/regional institutions and international procedures is mostly functional. Only strong and self-confident partners can make up. Poland’s inclusion in NATO and the EU helped it feel confident enough to open up to the East. A man of unimpeachable nationalist credentials like Prime Minister Vladimir Putin leading the process on the Russian side effectively made it secure and credible domestically. On the Polish side, Prime Minister Donald Tusk was bolstered by the election of like-minded Bronislaw Komorowski as the country’s president. Reconciliation can be achieved only by addressing squarely and with the greatest sensitivity the most serious historical grievances and topics of potential controversy. Archives dealing with the period of major grievances need to be made fully accessible to historians. In the Polish-Russian case, this was the 1940 Katyn massacre of Polish officers and civilians on Stalin’s order. Reconciliation, however, is not limited to guilt recognition and apology. It is about transforming the very nature of the relationship. Symbolic gestures count. Putin’s statement in front of the memorial to the Polish officers slain in Katyn was especially appreciated by the Poles. (As was the 1970 Kniefall by West German chancellor Willy Brandt in front of the memorial to the heroes of the Warsaw ghetto.) Earlier, Putin had won the praise of the Finns by laying a wreath at the tomb of Field Marshal Carl Gustav Mannerheim. Formal statements laying down the new official view of history are a must. In the Polish-Russian case, this was the “Statement by the Russian Duma on Katyn,” which laid the blame for the Katyn crime on Stalin and his henchmen. Joint work can achieve more than the traditional negotiating method. Joint commissions of historians need to be tasked with sifting through the newly available materials and coming up with compatible historical narratives. No less important, history textbooks need to be revised in accordance with the conclusions of the joint commission. The experience of the Polish-Russian Group on Difficult Matters in putting together its report White Spots—Black Spots: Difficult Issues in Polish-Russian Relations, 1918–2008 is particularly instructive in this regard. Involvement of societies is vital. Civic forums can play a leading role in rebuilding ties between the influential elements of civil societies. Churches can also play a major part, especially where they have strong moral authority. Television broadcasts, arts festivals, book translations, and sports events, by stressing the human essence of the “parties in search of reconciliation,” can break the ice and establish new closeness. One should be realistic. Overcoming long-standing historical grievances will not occur overnight, because in many cases reconciliation is more of an issue within countries than between them, and because the process is not so much about the past as about the present and the future when it comes to the underlying values and principles at stake. While the process requires leadership from the most senior levels, as the Poland-Russia case demonstrates, passing from a carefully nurtured political undertaking to a shift in attitude among publics at large takes time. And so must it be recognized that only so much can be achieved if all parties are not open, democratic societies. Still, even as differences exist on this score, it should not be an excuse for inaction. Deepen the Polish-Russian process by being more forthcoming on the issue of archive openness and encouraging more cross-border societal contacts. Bring youth into the picture, for example by building Polish-Russian youth exchange centers in Kaliningrad and the neighboring Polish regions (Gdansk and the like). Expand the reconciliation effort to include the Baltic states: Estonia, Latvia, and Lithuania. Engage the Russo-Baltic economic interests that are likely to benefit from improved relationships. Open the Russian archives dealing with the 1939–1949 period as they relate to the Baltics and establish, between Russia and each of the three Baltic states, joint bilateral commissions on difficult issues and joint commissions of historians. Return still-held national symbols transferred to Moscow in 1940, such as the Golden Chains of the Estonian president. As a measure of confidence building, refrain from military exercises in the border areas that are perceived as threatening by all sides. Expand cross-border business and cultural links in the border areas of Leningrad, Pskov, and Kaliningrad on the Russian side and the relevant counties of Estonia, Latvia, and Lithuania by concluding a local border traffic agreement as foreseen in the Schengen Agreement. Prepare for top-level visits by the Russian president to each of the three Baltic states, which would symbolically “normalize” bilateral relations. Such preparation would entail official statements by the Russian parliament on the issue of forcible annexation, accompanied by the Baltic states’ formal renunciation of reparation/compensation claims against the Russian Federation. Finalize the ratification process of the Estonia-Russia border treaty. Although reconciliation is essentially a bilateral process, make fuller use of the existing institutions, such as the Council of Europe, the OSCE, and others to which all parties belong. They can be valuable facilitators of the reconciliation processes. After two decades of effort, it is not possible to conclude that a sense of common destiny has developed in the Euro-Atlantic region. Nations continue to pursue traditional goals in traditional ways, and statesmen and politicians still think in terms of a world long past. There is generally great reluctance, if not downright opposition, to employing means to bring their citizenry or civic institutions into the processes of conflict resolution, historical reconciliation, or development of a more secure environment. Historical enmities remain strong and, perhaps most importantly, ongoing conflicts are being handled as diplomatic negotiations rather than as efforts toward reconciliation among societies. Overcoming the historical grievances that fuel these conflicts requires a broad-based, comprehensive, multilevel process—one that transcends official diplomatic efforts and that engages many different sectors of society in an active, positive dialogue with counterparts from the other side. The steps and approaches our working group has outlined will not in and of themselves achieve a fully formed and functional Euro-Atlantic Security Community. That goal will be one with a decades-long scope. However, we believe that movement in the direction this paper proposes can be a first step on a path toward addressing the fundamental elements that make diplomacy more effective and in tune with the needs of the twenty-first century. Parties can then begin to deal with the regional conflicts that have become a significant impediment to effective and productive cooperation across the Euro-Atlantic region, and in key areas advance and build upon the processes of historical reconciliation that have begun to address the root causes of historical enmity and hostility. John C. Kornblum (co-chair, United States). Senior counsel, Nörr Stiefenhofer Lutz, Berlin. Former chair, Lazard and Company, Germany. Former ambassador to Germany and special envoy for the Dayton Peace Agreement. Vladimir Lukin (co-chair, Russia). Human rights ombudsman of the Russian president. Former ambassador to Washington. Adam Daniel Rotfeld (co-chair, Poland). Former Polish minister of foreign affairs. Co-chairman, Polish-Russian Group on Difficult Matters. James Collins (executive director, United States). Director, Russia and Eurasia Program, Carnegie Endowment for International Peace. Former U.S. ambassador to the Russian Federation. Matthew Rojansky (executive director, United States). Deputy director, Russia and Eurasia Program, Carnegie Endowment for International Peace. Oksana Antonenko (United Kingdom). Senior fellow for Russia and Eurasia, International Institute for Strategic Studies. Vladimir Baranovsky (Russia). Deputy director, Institute of World Economy and International Relations. Oleksandr Chalyi (Ukraine). Ambassador Extraordinary and Plenipotentiary of Ukraine. Former first deputy foreign minister of Ukraine. István Gyarmati (Hungary). President and chief executive officer of the International Center for Democratic Transition and the Tom Lantos Institute. Former diplomat. Tedo Japaridze (Georgia). Director of the Center for Energy and Environmental Security, Azerbaijan Diplomatic Academy. Former Georgian minister of foreign affairs. Irina Kobrinskaya (Russia). Leading research fellow, Institute of World Economy and International Relations. Robert H. Legvold (United States). Marshall D. Shulman Professor Emeritus, Columbia University. Director, Euro-Atlantic Security Initiative. René Nyberg (Finland). Chief executive officer, East Office of Finnish Industries. Former ambassador. Harold Saunders (United States). Director of international affairs, Kettering Foundation. Chairman and president, International Institute for Sustained Dialogue. Jan Techau (Germany). Director, Carnegie Europe, Carnegie Endowment for International Peace. Dmitri Trenin (Russia). Director, Carnegie Moscow Center, Carnegie Endowment for International Peace. Igor Yurgens (Russia). Chairman of the Management Board, Institute for Contemporary Development. Non-Renewable energy will end after next 50 years The non renewable energies are end after next 50 year. so then what we do??? it is huge problem of futuer in the world. I think it is very conflict in futuer. some time will be war in the world for energy. so now we must think about that deeply. as well as we must move to another energy source. as renewable energy source if not we can't face that problem suddenly when it come to close. so lets we move to renewable energy. you can get more idea about Renewable energy from bellow Web site it is made for the help to learning about Renewable enery. http://renenginfo.weebly.com/ thank you!